In celebration of Body-Solid’s quarter of a century manufacturing in the fitness industry, we have developed a limited-edition premium 25th Anniversary G6B Home Gym, the G6B25YR. Already one of our most popular home gyms, we have added a number of premium upgrades including an all-new aluminum pulley package and clear-coated red and black paint. The G6B25YR also features our patented bi-angular converging press station as well as a chest, incline, shoulder press and leg developer station incorporating our friction-free SmoothGlide Bearing System among other great features. Easy-to-use, space-efficient and strong — the limited-edition premium 25th anniversary G6B25YR is simply one of the best home gyms on the market. The Bi-Angular press arms of the G6B guide you through the optimal natural range-of-motion while applying resistance from two directions simulaneously. This smooth, fluid, multi-directional resistance system automatically produces 25% more muscle interaction by eliminating the ability to rest your chest muscles. Thus, you increase the exercise intensity through a full range of safe, convergent, multi-joint, multi-plane movement patterns. Bi-Angular Press Arms: Our patented Bi-Angular® Press Arm guides you through the optimal range of motion while applying resistance from two directions. The smooth, multi-directional resistance increases muscle interaction by 25%. Now you can enjoy the benefits of Bi-Angular® Technology when doing chest presses, incline presses and shoulder presses. It’s like working out with free weights. Lat Pulldown / High PulleyStation: Perform lat pull downs, triceps press downs, cable crossovers and many more high pulley exercises. Adjustable hold down pads stabilize your body for lifts beyond your body weight. Unique versatility allows you to increase the strength and endurance of your back muscles. Ab Crunch / Mid Pulley Station: Develop awesome abs and terrific triceps quickly at this strength training station. Biomechanically engineered for smooth, comfortable, full range of motion crunching movement. Specifically designed for firming, flattening and isolating the entire abdominal area. Perfect Pec Station: Equipped with swivel arms and designed for both unilateral and bilateral movements you get the maximum stretch for deep muscle toning, and the most incredible upper body development possible. Leg Extension / Leg Curl Station: When you' re ready to build muscular legs and stronger knee joints, this leg developer is ready to help you meet your goals. The leg developer’s SmoothGlide Bearing System™ combined with the self-aligning leg cuffs guide you through the most demanding leg curls and leg extensions. Seated Row / Low Pulley Station: Essential for well-developed backs, seated row exercises build depth in the middle back and train the hard to reach lower lats. Low pulley swivels smoothly and fully to provide accurate resistance for cable curls, upright rows, shrugs, leg abduction, leg adduction and much more. Powered by a 210 Lb. AlloyWeight Stack: Advanced alloy weight stack plates are machine drilled to exact specifications and employ stateof- the-art nylon bushings for super smooth and quiet operation. Patented Bi-Angular® converging press station replicates a free weight dumbbell press and produces 25% more muscle interaction. 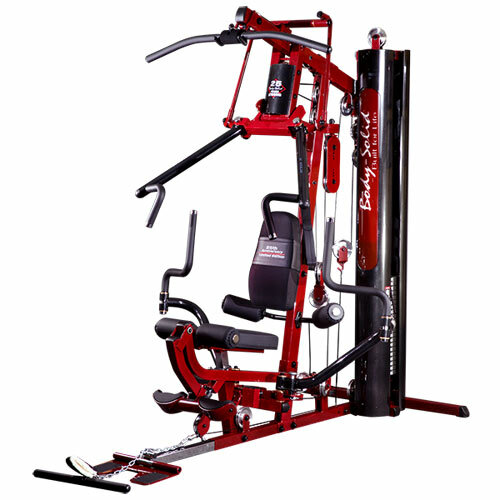 Chest, incline, shoulder press and leg developer stations incorporate the friction free SmoothGlide Bearing System™. Self-aligning, contoured leg extension cuffs automatically adjust throughout the exercise movement. Integrated leg developer CAM prevents resistance drop-off at the end of the exercise movement and provides consistent resistance throughout full range of motion. 210 lb. (95kg) selectorized weight stack. Optional 260 lb. (118kg) weight stack available. High-density, top grade DuraFirm™ pads with lumbar support provide ultimate comfort and prevent lower back strain. Telescoping, chrome plated, gas-assist adjustable seat post for quick, smooth adjustment and proper body positioning. Flip-up seated row foot brace plate stabilizes your body when using heavy resistance. 2,200 lb. tension strength, military spec, steel aircraft cables with swiveling ends provide durability and low maintenance. 4½” pulleys are impact resistant fiberglass reinforced nylon with precision machined steel ball bearings. 2” x 3”, 11-gauge mainframe construction assures maximum strength, function and durability. 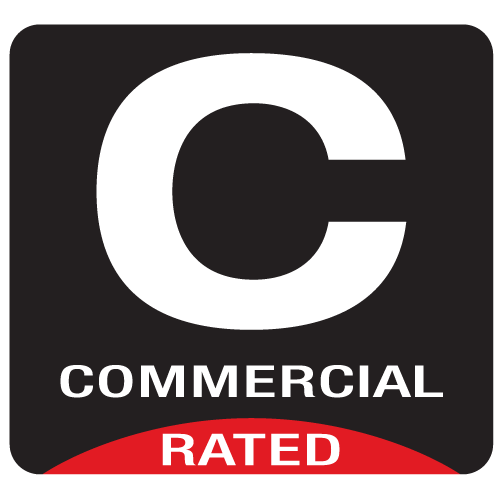 Tough, durable, electrostatically applied powder coat finish. Easy to use, space saving, no-cable-change design. Includes revolving lat bar, revolving straight bar, ankle strap, ab / triceps strap, Total Body Workout™ DVD, full size exercise chart and convenient water bottle and towel holder. 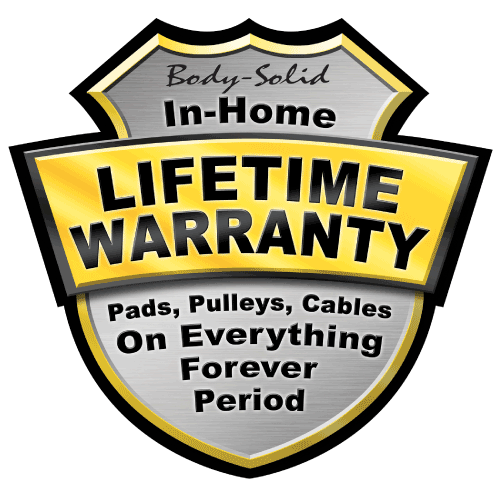 This Warranty applies only in the United States to products manufactured or distributed by Body-Solid, Inc.(Body-Solid) under the Body-Solid brand name.